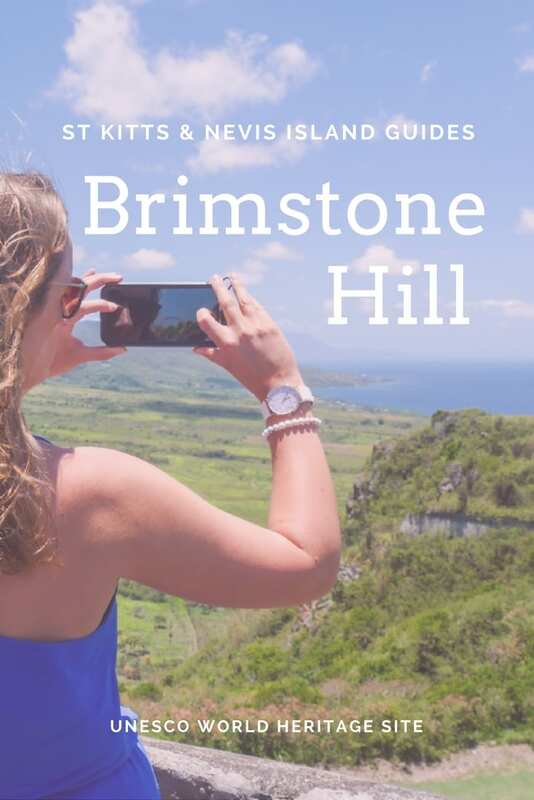 A site of great importance to both the Federation of St Kitts & Nevis and the local region, Brimstone Hill is well worth adding to your itinerary if you’re planning a trip to St Kitts. 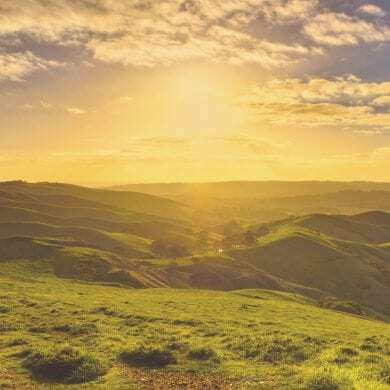 The panoramic views from the Citadel alone will validate my claim, however the National Park has much more to offer than just a scenic lookout. The first West Indian island to be colonised by Europeans, during the late 17th and 18th century, St Kitts saw many battles as the French, Spanish, and British fought for dominance in the region. 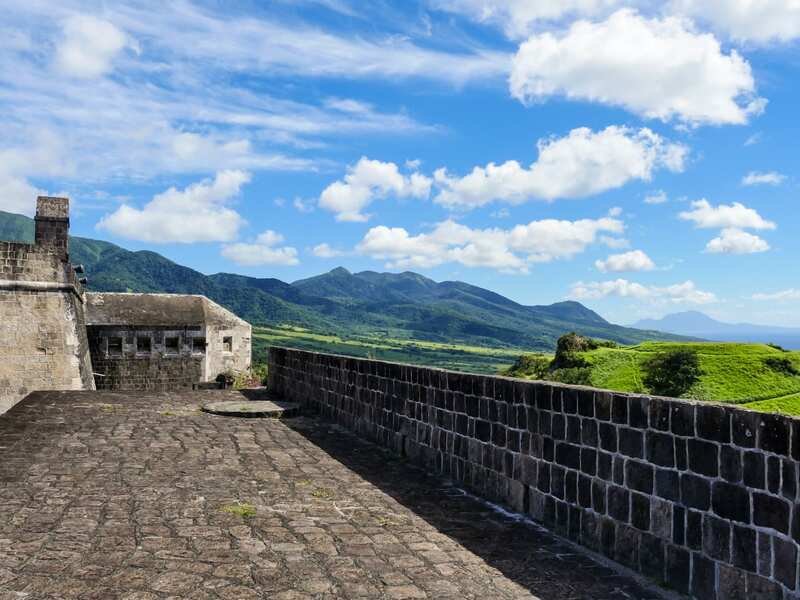 Designed by the British military and built by African slaves, Brimstone Hill Fortress sits atop a double peaked, steep volcanic hill rising some 230 metres above sea level in the shadow of neighbouring Mount Liamuiga. 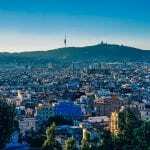 One of the earliest surviving examples of ‘Polygonal’ fortress design, its construction was a feat of engineering and a testament to human resolve. 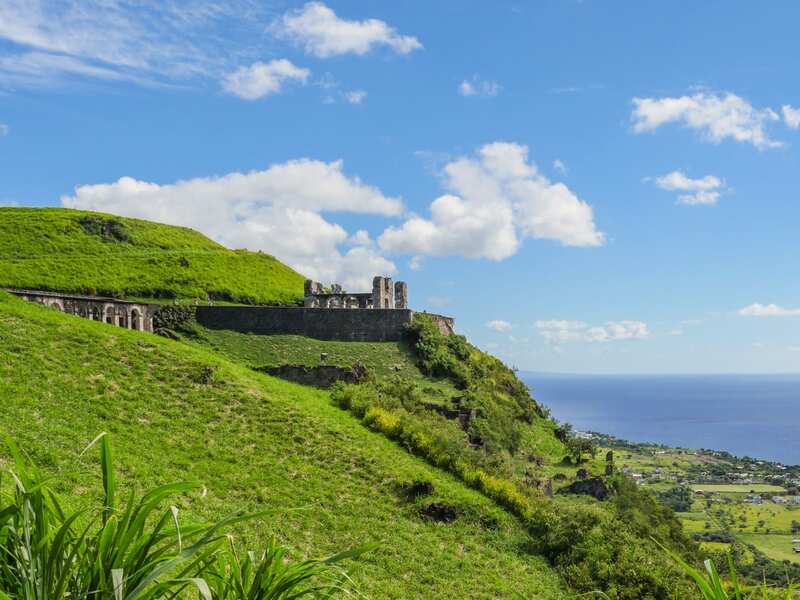 Considering a visit to this must-see destination on St Kitts? 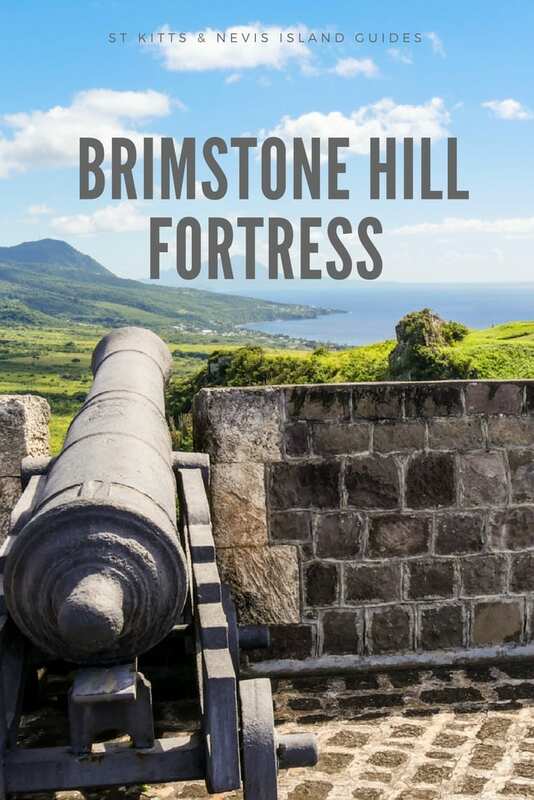 Here’s a comprehensive Brimstone Hill Fortress visitor guide to help you plan your day. Whether you’re a cruise passenger on St Kitts for the day or you’re planning an extended stay on the island, the best place to start your day (unless you have your own rental car), is the cruise terminal in Basseterre. 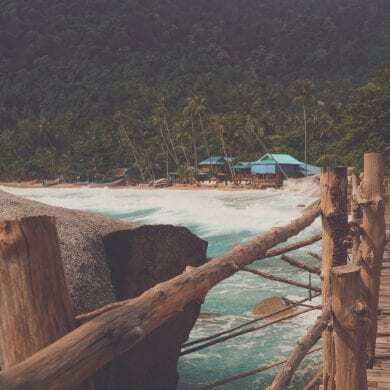 From here you can barter either a half-day or full-day rate with a local taxi driver who will drive you the 12.5 miles (20 km) north along the island’s west coast, and possibly show you some of the other local highlights too. Be mindful that larger groups (four or more) will find this to be more cost effective per person because most taxis are small mini-vans that seat eight people and the driver will likely be asking the same rate regardless of whether you’re a party of two or six. Always clarify which currency you are negotiating in. Most vendors will assume you are American and quote you in USD. The entry fee for Brimstone Hill is US$10 per person, cash only. Make sure you pack a bottle of water and a snack. Most places you stop cater to tourists but it’s easy to dehydrate in the warm climate. Take some cash as credit cards are not accepted everywhere you go. St Kitts uses the Eastern Caribbean Dollar and the US Dollar, but most street vendors prefer smaller US bills or the local ECD. 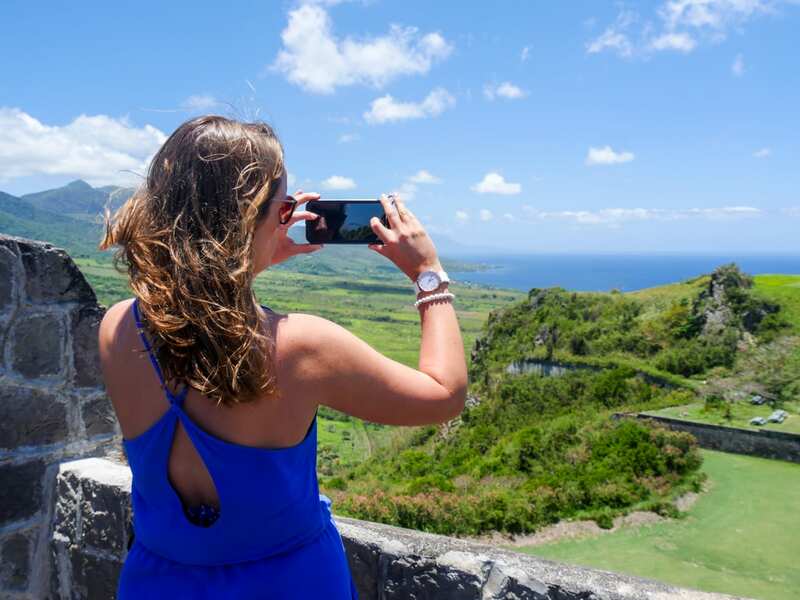 Camera, smart phone, and GoPro are not essential but necessary if you want to capture the incredible vistas sweeping out from atop the Fortress in every direction. As you turn off the main island road and begin the climb towards the fortress your driver might point out the ruins of a lime kiln at the foot of the rise. This site was integral in the construction of the fortress: The walls of the fortress were constructed using stone carved from the volcanic rock of which the hill is composed, and these stones were cemented together using a mortar made from the limestone covering much of the lower slopes. Through the first archway and past the Magazine Bastion (the walls of which were breached by the French in 1782), the road continues up to the Orillon Bastion and the ruins of the Royal Engineers’ quarters. You can drive in here but the taxi will likely continue through the archway of the Prince of Wales Bastion and into the Parade Ground which is used as the main carpark. If you have the time (or if the Citadel is particularly busy) take a walk back down the hill and explore these ruins. I’ve been to Brimstone Hill a number of times and very rarely do I see people venturing down here; make the most of the opportunity to explore on your own. From the main car park (looking out to sea) walk left over to the ruined Artillery Officer’s Quarters beneath Monkey Hill or right up the steep steps to the Fort George Citadel. For those interested in an in-depth view of the Fortress and its history the visitor’s centre provides an orientation video (in an air-conditioned room), which is well worth watching if you’re a history buff. 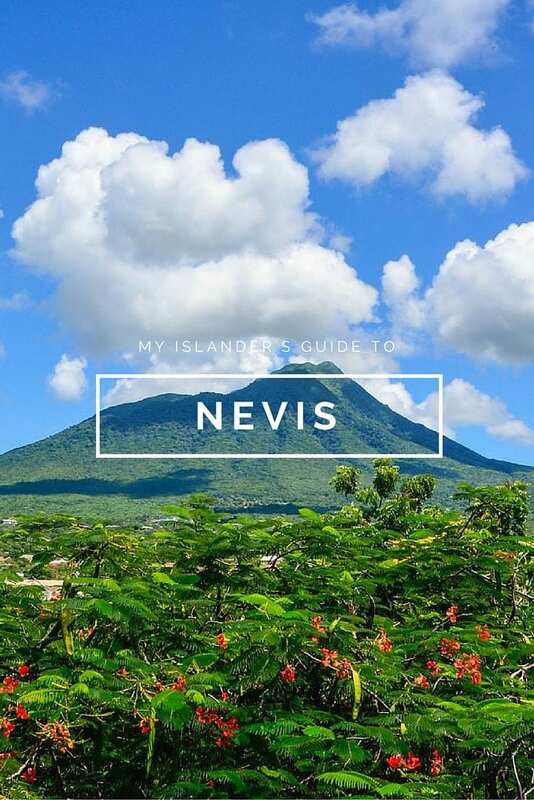 If you’re planning a trip to St Kitts I can highly recommend a day-trip to the neighbouring island of Nevis. 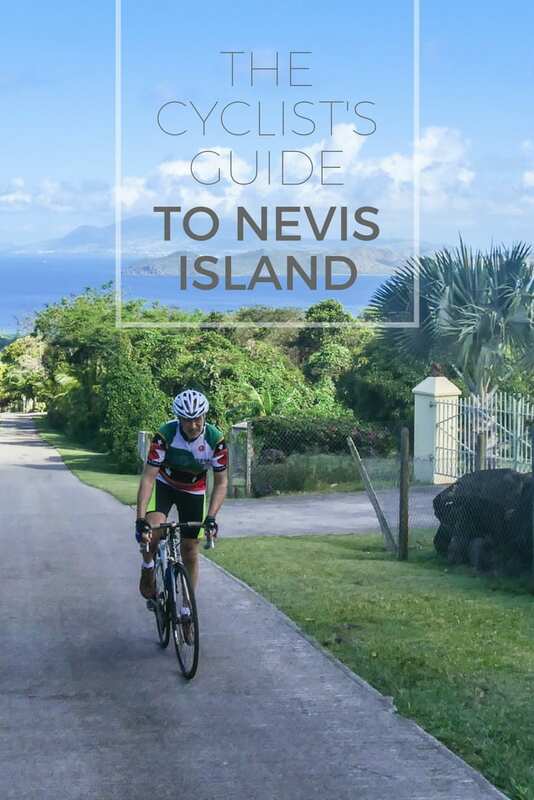 Read my Nevis travel guides for tips and inspiration. The grassy knoll of Monkey Hill stands above what was one of the finest residences at the Fortress. 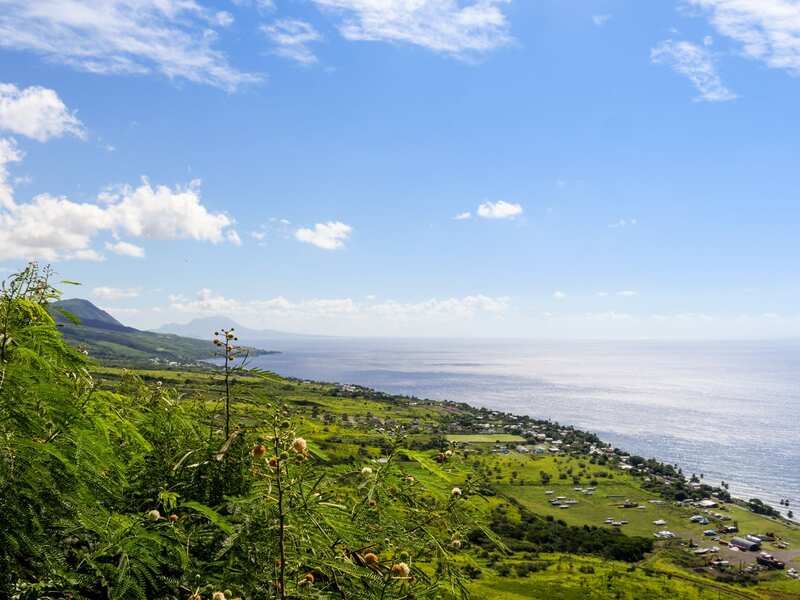 Offering spectacular views over St Kitts’ south western coastline and, on a clear day, across the sea to neighbouring Montserrat, this is one of my favourite spots in the park. From Monkey Hill make your way down the stone steps that lead to the Infantry Officers’ quarters and the Orillon Bastion where the hospital was located. There are also a number of tombstones in the cemetery here. Museum displays that highlight the basic living conditions and harsh realities of serving at Brimstone are found in the Citadel; their illustrations came to life as I walked through the ruined fort and imagined the conditions the soldiers experienced. 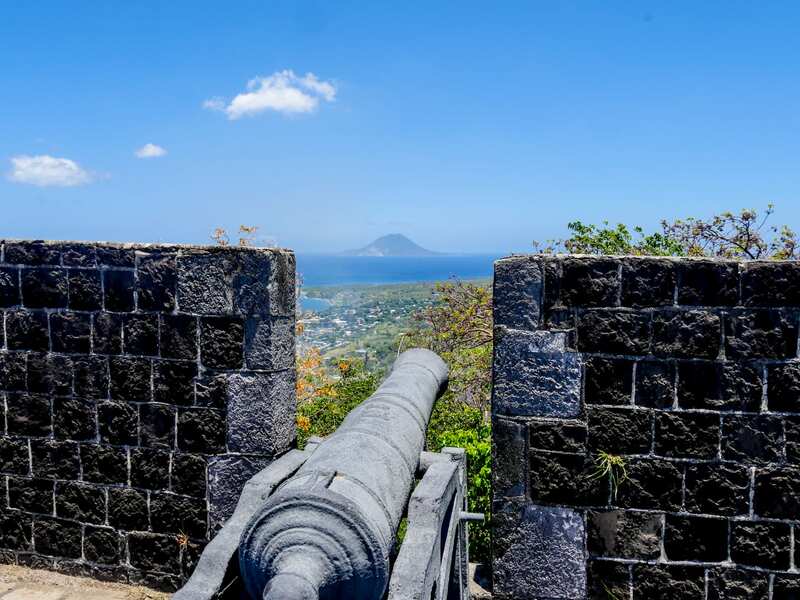 The Citadel is the showpiece of the park; Battlements lined with 24-pounder cannons trim the structure and breath taking 360 views of ocean, islands, and volcanic peaks. Take a moment or two on the Western Palace of Arms affront the Citadel. Unless the weather is particularly bad you’ll see the islands of Sint Eustatius and Sabre rising from the ocean around 7 miles away. Cross the moat on the foot bridge and explore the many barrack rooms that now house museum displays. From the topography of the island, to a day in the life of a solider, and the history of the many battles fort and won on the hill, the Fort George Museum gives a detailed account of the entire UNESCO site. Walk across the Citadel and through the barrack room to the right of the stairs that lead up to the battlements. Here you’ll find a stone corridor which leads you out to the Eastern Palace of Arms where 24-pounder cannon are aimed at Mount Liamuiga. The verdant views contrast those over the ocean yet are just as splendid. The first cannons were mounted on Brimstone Hill in 1690 by the British in an effort to recapture Fort Charles on the coast below from the French. It was at this time that they realised the value of the site and construction began on the Fortress that stands today. In January 1782, 8000 French soldiers attacked the island and besieged Brimstone Hill Fortress. 1000 defenders drawn from the Royal Scots and East Yorkshire regiments, local militia, and escaped slaves fought back against the attack for over a month before surrendering. The French then allowed all the defenders to march out of the Fortress with the honours of war. One year later the Treaty of Versailles returned St Kitts to the British and their soldiers returned to fortify the site. In 1852 British troops were reassigned and the fortress was abandoned until 1965 when the Society for the Restoration of Brimstone Hill was founded. Eight years later HRH Prince Charles reopened the newly restored Prince of Wales Bastion. In 1983 St Christopher and Nevis was given independence by the British. In 1987 Brimstone Hill Fortress was affirmed as a National Park, and in 1999 it was inscribed as a UNESCO World Heritage Site. Today the site is administered by a registered non-profit organisation on behalf of the Government and the people of the Federation. 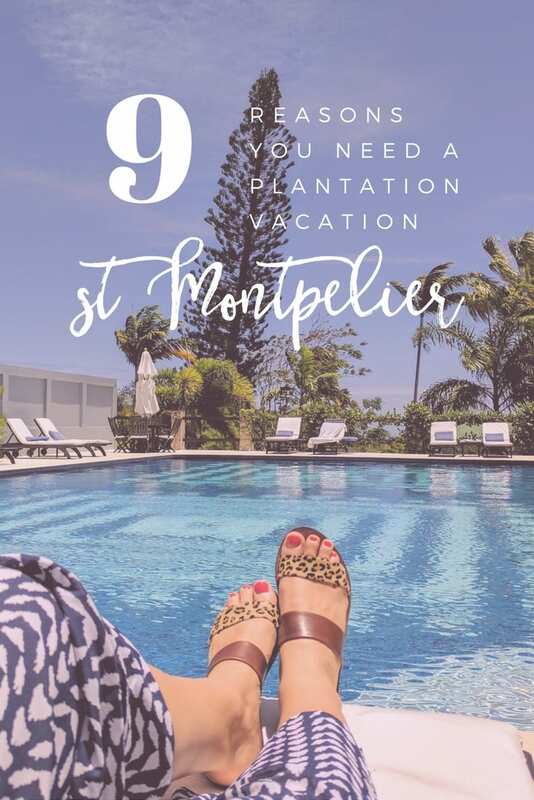 Monkey Hill – From the southern edge of the park you’ll find views over St Kitts’ two volcanic peaks, lush farmland, and the sweeping western coastline of the island. On a clear day you can also see the island of Montserrat silhouetted on the horizon. Western palace of Arms – The battlements offer a chance to photograph the iconic black cannons against an island backdrop. 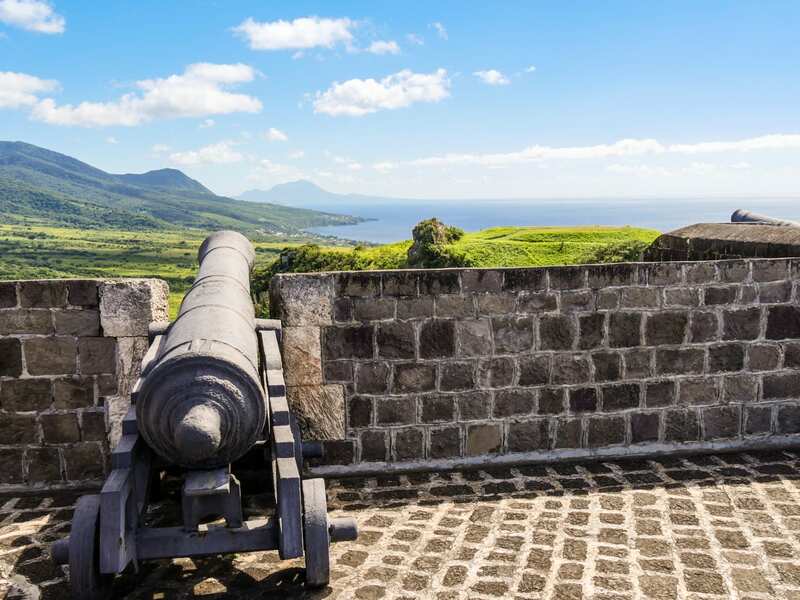 The Caribbean Sea stretches out towards the islands of Sint Eustatius and Sabre, and if you take your shot at the right angle it appears as though the battlements extend over a sheer cliff. Quite the dramatic image. Fort George Citadel – Atop the Citadel you’ll find an old bell housed in a stone surround. Once used to call the soldiers to eat, the image of it sitting atop the battlements is highly instagrammable. 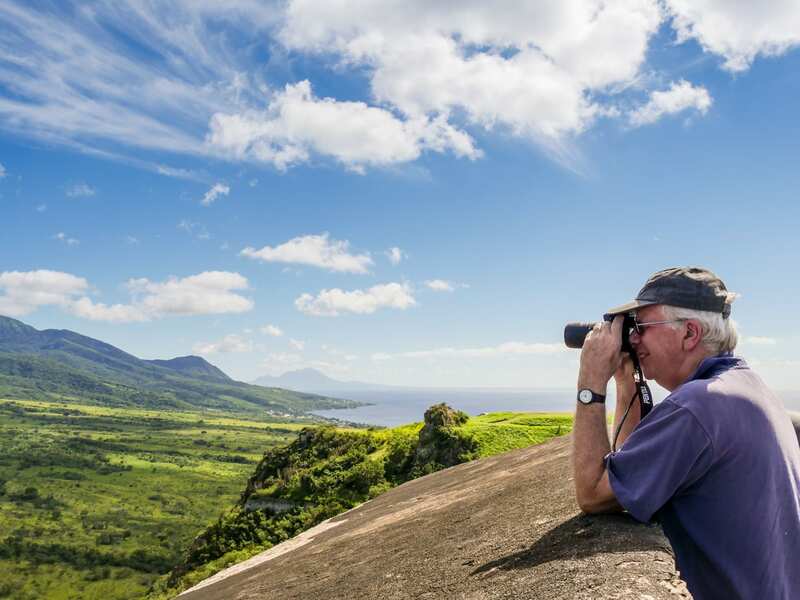 Parade Ground – From the carpark you’ll find some pretty picture-perfect shots of the volcanic Mount Liamuiga. Experiment with including the cannons that line the edge of the ground, and the large Flamboyant tree (which blooms with vibrant red flowers May through September). Have you visited Brimstone Hill Fortress? 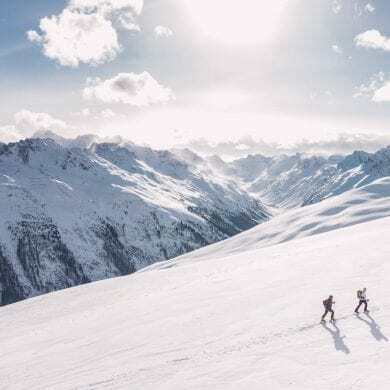 Share your travel tips in the comments below!